Samson Doors have a very exciting new range of Steel Doorsets on offer. 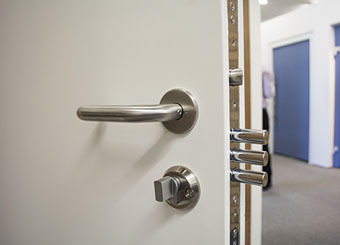 The Samson SteelGuard range consists of made to measure steel doorsets that offer greater flexibility than others with an assured construction method, using high quality steel the door offers a 10 year guarantee against corrosion. Samson steel doors are made to last and not just to a price for internet selling. We make sure you are not exposed to the risk of non-compliance with genuine UK tested doors with UK and European certifications, not just made up certificates to look compliant. 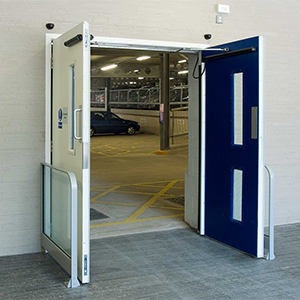 All the steel doors are generally suitable for domestic, commercial and industrial applications with the specifications adjusted to suit the environment and specific requirements of performance.The SteelGuard Range is split into three categories, consisting of Domestic, Commercial and Glazed products. Every Samson steel door is manufactured to a specific approved standard and supplied with relevant certification for the specific use and compliance in the chosen environment. A Samson steel doorset will provide years of trouble free operation and you can be sure it will satisfy the stringent requirements of compliance with all necessary certification to provide a risk free installation. Compliance should not be a difficult process, and with the right understanding of the requirements in the environment, the relevant door and specification should be easy to identify and supply. The correct documents and certification should be provided as a matter of course. Adjustable fixing feet and variable sub-frames. Locks are always fitted into a purpose made internal reinforcement box not hung from the fore end plate loose into the leaf. A pot of touch up paint. Samson doors are manufactured in a range of materials offering strength and durability. Our external doors are manufactured using Magnelis© sheets and can offer an anti-corrosion warranty of up to 10 years* with a standard PPC coating. *Only in areas classed up to C3 rating. Reduced warranties are offered for C4 and C5 ratings. Samson doorsets are available polyester powder coated and the door blade can be patterned in a range of designs. We can also offer specially finished woodgrain PPC on request, which combines the traditional look of timber with the modern durability of steel.